Ystradfellte is a small village on the Afon Mellte in the Fforest Fawr area of the Brecon Beacons National Park. The village is a popular centre for tourists, many of whom walk in the hills or visit the waterfalls and caves of the river. Ystradfellte is very much a dispersed agricultural community, with the focal point being the small village with church, pub and Post Office. 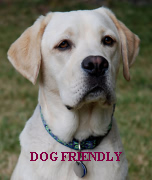 Unfortunately the pub is only open at weekends; the Post Office is open from 10.00 - 12.00 on weekdays. The village takes its name from the river Mellte which runs close by. The church of St Mary's although Medieval in origin is believed to have been completely rebuilt in the 16th century. The church and churchyard contain some interesting grave memorials. At the southern end of the western Beacons the Ystradfellte area with its lush wooded valleys in a classic limestone landscape is a total contrast to the barren mountains to the north. 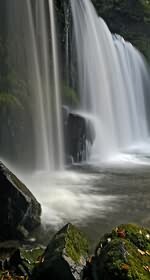 It is incredibly popular for walkers as there are many walks that take in the picturesque waterfalls common in this area. A mile south of Ystradfellte the River Mellte disappears into the mouth of Porth-yr-Ogof, White Horse Cave. This cave has the largest cave entrance in Wales - it is nearly 20 metres wide and 3 metres high. Porth yr Ogof car park is manned most days and there is a car park charge of £3 per day. The cave entrance can be accessed just a few minutes walk from the car park, but it is a steep climb down the worn and uneven limestone so it might not be suitable for everyone. There are 3 kilometres of explored cave passages and it is a popular location for experienced cavers. It is recommended that the caves are explored with an experienced local caving guide or is tackled as a group activity through one of the local outdoor centres. 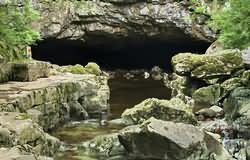 Caves: The area around Ystradfellte is renowned for its caves and karst scenery, making caving a popular activity. Ogof Ffynnon Ddu (Welsh for Cave of the Black Spring; also known as OFD) is a cave located under a hillside in the area surrounding Penwyllt in the Upper Swansea Valley in South Wales. At 308 metres (1,010 ft) deep and 48 kilometres (30 mi) long, it is the deepest cave in the UK and the second longest in Wales. Ogof Ffynnon Ddu was discovered in 1946 through digging by Peter Harvey and Ian Nixon, members of the newly formed South Wales Caving Club. Major extensions were discovered in 1967. The system is famous for its intricate maze-like structure and its impressive main stream passage. It forms the Ogof Ffynnon Ddu National Nature Reserve. One of the largest cave systems in Britain, the caves and tunnels of Ogof Ffynnon Ddu weave a long and difficult path beneath the Tawe Valley. Deep underground there is an amazing collection of specialised wildlife, including cave shrimps and the pale blanched trout which haunts underground rivers. Deep cracks in the large expanse of moorland above provide habitats to a wealth of plant life, including the lily of the valley and wood anemone. A popular attraction near the village is the Waterfalls Walk, a generally easy walk along the Afon Mellte. The route passes two main falls on the river, Sgŵd Clun-gwyn and Sgŵd Isaf Clun-gwyn. 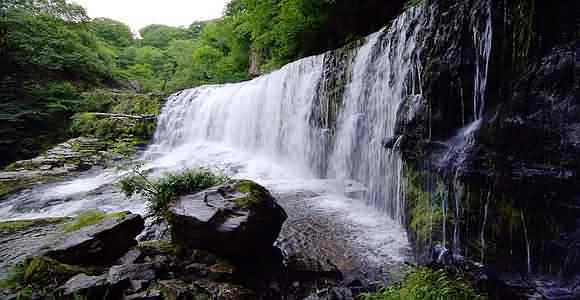 The climax of the walk is at Sgŵd yr Eira on the Afon Hepste where the footpath passes behind the waterfall. The easier of the walks is the clearly signposted "Waterfall Walk" that takes you from the car park at Ystradfellte along the Afon Mellte. This leads you to two of the main falls, Sgŵd Clun-gwyn and Sgŵd Isaf Clun-gwyn passing Sgwd y Pannwr, a lower rocky fall, on the way. 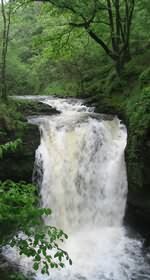 The walk's climax is the Sgwd Y Eira, Spout of Snow, that has a natural path behind the waterfall. For a different view of a waterfall you can walk along this path, but be careful as it can be slippy. Well worth the experience as you watch the curtain of water tumble over the rock above in front of you. There are longer walks between Ystradfellte and Pontneddfechan that take in other falls such as Sgwd Gwladus, Lady Falls, on Afon Pyrddin and Horseshoe Falls and Sgwd Ddwli along the Afon Nedd Fechan.